To advance through the bracket, teams have two options. Option 1 is to play the game (two 20-minute halves, 2’s and 3’s, clock stops last two minutes, common fouls in last two minutes are 1-and-1). With geography part of the bracketing process, the hope is several games can take place. Option 2 is determining the winner 50% by expected score of the game at a neutral site (by KPI) and 50% by fan vote. This allows for a team’s performance to be quantified as well as for managers to help generate fan votes for their school and managers. The expected score of the game (and hence 50% of the vote) is listed on the bracket for each matchup. Twitter polls will again be used to determine the 50% fan vote. Nearly 150,000 votes were cast during the inaugural 2016 Tournament. As an example, the expected score of Western Kentucky and Florida State is Western Kentucky 68, Florida State 67. WKU would have 50.3% of the expected score, and FSU would have 49.7%. When adding the fan vote, the team with the most combined percentage points will win. The expected score (based on 100 total points) will be posted with the matchup when fan voting begins. All results of regular season games will be official at 5 p.m. ET on Sunday, March 12. It is the responsibility of each team to check for any errors in reported results. Information on voting will be released with the bracket. As of February 27, 163 schools from 27 conferences have participated in 344 Manager Games across the country. 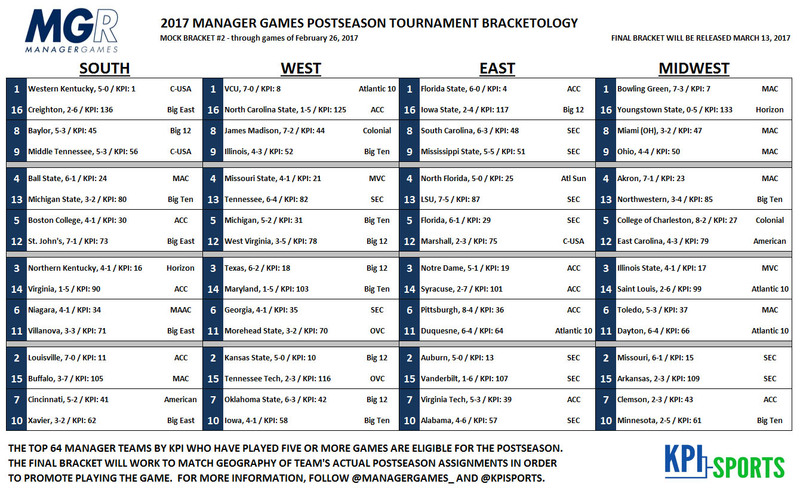 68 schools are already eligible for selection into the Postseason Tournament by having played five games entering the stretch run. For more information on Manager Games, follow @ManagerGames_ and @KPISports on Twitter.